If you have any questions about the KLOSTERS information page below please contact us. The sailing yacht KLOSTERS is a 47 m 154 (ft) spacious steel boat which was crafted by Perini Navi and her design plans were devised by Perini Navi. A large ketch motor sailer KLOSTERS is a particularily well designed Italian made yacht which was launched to praise in 1990. Sleeping 10 guests and 8 crew, sailing yacht KLOSTERS used to be 8806 Xasteria; Xasteria I; Sunrise. The yacht is a modern ketch motor sailer. The balanced boat has been designed from naval architects Perini Navi. 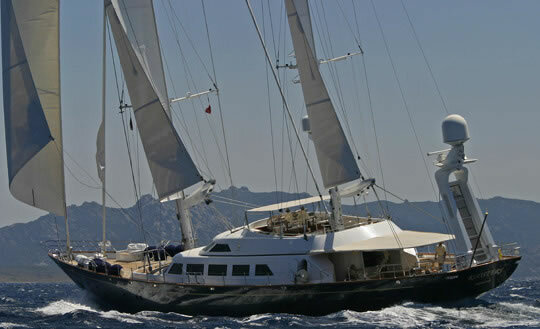 Perini Navi was involved in her interior design brief. Perini Navi was the naval architect involved in the professional vessel design work for KLOSTERS. Her interior design was completed by Perini Navi. Perini Navi is also associated with the yacht wider design collaboration for this yacht. Created by Perini Navi the yacht was fabricated in the recognised yachting country Italy. She was officially launched in Viareggio in 1990 before being delivered to the owner. The main hull was built out of steel. 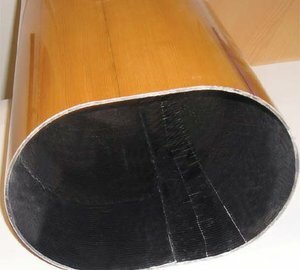 The sailing yacht main superstructure is fabricated predominantly with aluminium. With a width of 9.2 m / 30.2 feet KLOSTERS has fairly large interior. She has a fairly 6.9 (22.9 ft) draught of 6.9m (22.9ft). She had refit improvement and modification carried out by 2008. Powered by twin MTU diesel main engines, KLOSTERS can attain a top speed of 14 knots. KLOSTERS is propelled by twin screw propellers. She also has an efficient range of 4000 nautical miles when sailing at her cruising speed of 14 knots. Her total HP is 1200 HP and her total Kilowatts are 883. As for bow thruster maneuverability she uses Zoller, Schottel. The spacious luxury yacht S/Y KLOSTERS is able to accommodate as many as 10 guests and has 8 professional crew. 47 metres / 154.2 feet. Giving the combined power of 1200 HP /883 KW. 4000 at a speed of 13 knots. Northern Lights 2 times 75 kilowatts, 1 times 42 kilowatts. On October 2009 KLOSTERS went to Palma, in Spain. 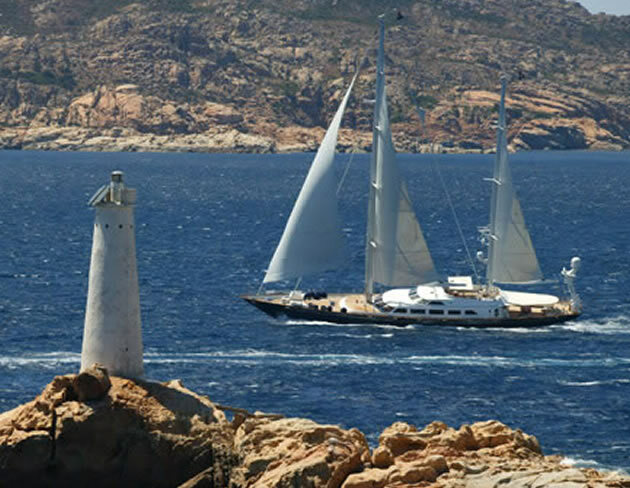 This sailing yacht also cruised the cruising ground around Illes Balears during the month of October 2009. The yacht was supplied with Condaria A/C. KLOSTERS features a teak deck. The luxury yacht KLOSTERS displayed on this page is merely informational and she is not necessarily available for yacht charter or for sale, nor is she represented or marketed in anyway by CharterWorld. This web page and the superyacht information contained herein is not contractual. All yacht specifications and informations are displayed in good faith but CharterWorld does not warrant or assume any legal liability or responsibility for the current accuracy, completeness, validity, or usefulness of any superyacht information and/or images displayed. All boat information is subject to change without prior notice and may not be current.